This experiment came about when a friend challenged me to make a chocolate banana cake that would rival that of Future Bistro. My personal challenge was to get rid of various ingredients in my kitchen and put them all in one recipe. Making the cupcakes look like a banana split sundae was a last minute thing. Mix flour, cocoa, baking powder, baking soda and salt separately. Add flour mixture to butter mixture in 3 parts alternating with the yogurt. Begin and end with flour. Pour into prepared cupcake wells and bake for 18-20 minutes. When cooled, pipe on frosting (recipe to follow). Add 1 tbsp of butter or margarine to the melted chocolate and drizzle over the frosting. 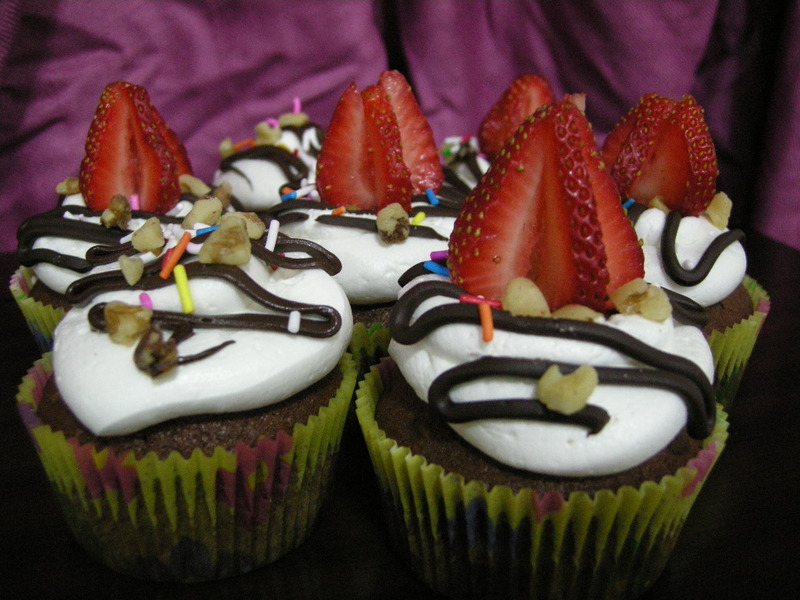 Sprinkle with walnuts and sprinkles and top with a strawberry.